Seat time. How many minutes of actual learning time are expected? Screens. How many screens of content will be needed? Considered another way, if you’re using presentation slides (e.g., Powerpoint) as a starting point, how many slides do you have? Interactivity. Light to medium complexity is often low cost due to the capabilities of many authoring tools. (Examples include drag and drop exercises, or multiple-choice questions.) Complex interactions including animation will require more time and effort. Audio/Narration. Do you have audio files ready to go or do you need narration recorded? You may also require language translation as well. Video. Does it already exist and just need editing, or do you require new scripts to be written and video to be shot? 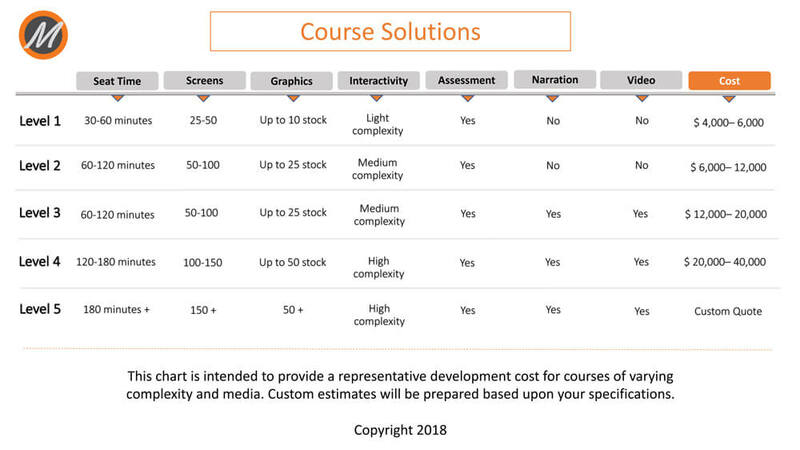 While Monarch works collaboratively with you to determine the best approach given the requirements and budget of your custom project, the chart below will give you an idea of the cost ranges associated with different approaches. 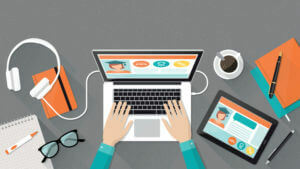 We hope this is a helpful starting point when you are considering your next eLearning project.